Is your child constantly on their phone? Do they watch TV whilst looking at their phone? Do they struggle to go to sleep after using their phone? Do they carry their phone into bed? Do you notice in improvements in their mood if a positive message comes in, or a decrease in their mood if they get no message at all? Do they use their phone all the time even during social interaction? Are you worried that your child has cellphone addiction? Experts are not sure if cellphones are "addictive" like drugs or alcohol. They do agree that cellphones can create compulsive behaviors that can have a negative affect on a person's life. Wikipedia defines an addiction as a state characterized by compulsive engagement in rewarding stimuli despite adverse consequences. According to the World Health Organisation cellphone addiction is now classified as a dependence syndrome. time out - after a certain time at night the cellphone must be switched off and in some cases given to the parent to keep with them until the next day. 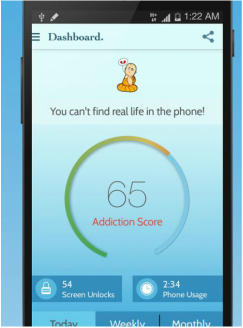 Break free cellphone addiction: This app monitors your usage & gives you warning & useful stat to make you aware of your addiction level. It also provides tools to help reduce addictive behavior. Dinner time plus: This app gives parents the ability (via the parent version of the app) to lock & unlock the child's phone during dinner, studying and bedtime. It also provides parents with real-time monitoring, usage reports and the ability to set time limits.